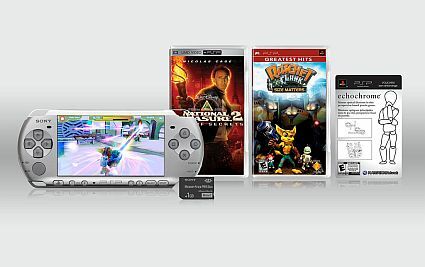 SCEA managed to pull another fast one on us as they’ve just announced the North American details concerning the PSP-3000 complete with release date. Sure rumors have been floating around for the past month but I didn’t expect the unit to pop out so soon. If you’ve just bought a PSP-2000 or Slim & Lite in the past year, you’re likely curious as to how unit is different from what you’re currently holding. Sadly, there’s not a lot to get me excited. The built-in mic is a huge plus for regular Skype and Go messenger users who don’t want to swap their current headsets for more cumbersome Skype-able ones. As for the screen, I’m hoping that it lives to it’s promies, and be able resist glare. This will be quite indispensable for outdoor gaming. THe video-out has been upgraded enhanced to accomodate televisions that don’t support a progressive output (that means non-HDTVs). Yes and no. Yes if you’re looking to get that better screen, and be able to use all your current accessories. No if you’ve just bought a PSP-2000 and are contemplating on getting the new unit. When will I get my hands on this? AC adaptor and battery pack.